I received a blog award this weekend! 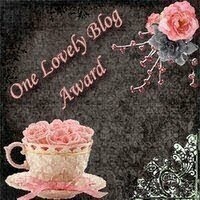 The One Lovely Blog Award was passed to me (and four other bloggers) by Staci at Lizard & Ladybug (Thanks, Staci!). I’m thrilled! These are some really talented ladies. Please take a moment to check out their blogs… you’ll be glad you did! Sorry, I didn't see your message...how did you send it? Kristin, I sent it through Google because I couldn't find an email for you. Glad you found this! Thank you so much! I've been crazy busy here at home (hence the lack of blog updates). Thank you for thinking of bubsies! I will post your blog award this weekend. Good luck to you!